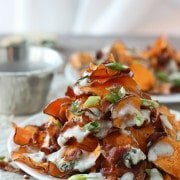 I wanted to give up carbs and dairy in preparation for our upcoming beach trip. Whole-wheat noodles (for fiber) intermixed with a healthy dose of zucchini noodles, and only a smidge of cheese (for calcium of course) – I think I compromise quite well, don’t you agree? We must pause for an intermission, as I’m writing this post, I’m simultaneously watching RHONJ and just saw a preview for RHONY tomorrow, and Aviva is THROWING HER LEG across the room, ummm WTF? Sorry, I just felt it needed to be addressed. That girl gets crazier with each episode, and it’s not the fun kind of crazy that entertains me, it’s the kind of crazy that drives me absolutely bonkers and gives me a weird angry stomach ache. It just baffles my mind that real people actually behave this way. Anyways, we were talking about compromise, right? A compromise is how this pasta dish ended, but it began with something simple – fresh basil from our garden. I just adore fresh herbs; in the wintertime, sage and rosemary are always something you’ll find in my recipes, but in the summer, fresh basil reigns supreme, as it should. 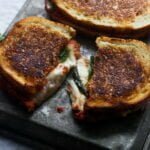 As of late, I haven’t been able to use our basil fast enough, and I’m ashamed to admit, but I haven’t actually used it as the main ingredient in anything. Of course it’s been torn over tomato salads, used as a garnish in many a pasta dishes and I’ve even nibbled on it straight from the plant, but until today I hadn’t really utilized it. So naturally, I had to transform it into its most delicious state – pesto. This pesto only slightly deviates away from the traditional; instead of 100% basil, I used 1 cup of basil, and ½ cup flat leaf Italian parsley, simply because it’s more cost effective for you. Instead of pine nuts, I swapped in toasted slivered almonds; and finally, I added in just a touch of water to reduce the oil content and lighten it up just a tad. The other common suspects are there – parmesan cheese, garlic and olive oil. 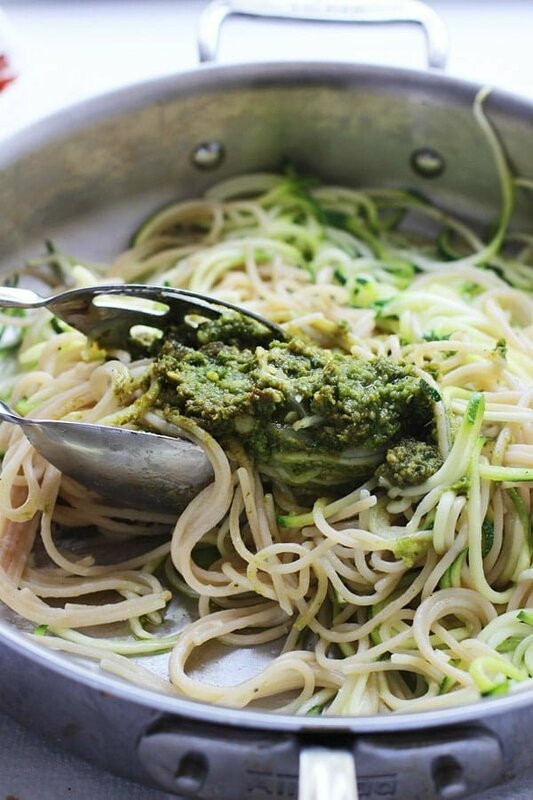 The hot aldente whole-wheat spaghetti and zucchini noodles are tossed with the pesto, and moistened up with a ladle full of starchy cooking liquid, and seasoned with a generous dousing of salt (Very important!). 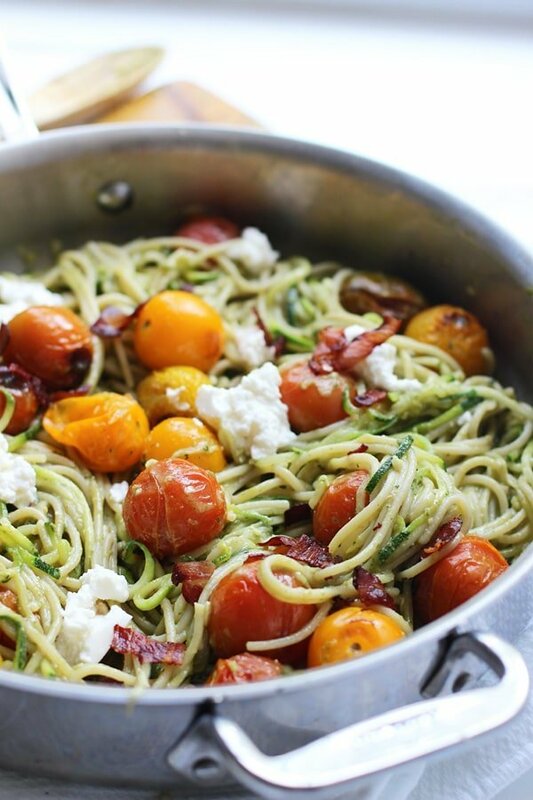 At the last minute, tomatoes blistered under the broiler are gently tossed with the noodles and pesto, and then the entire dish is dotted with whole-milk ricotta for extra creaminess and sprinkled with crispy prosciutto for texture and a salty bite. I can’t stress enough how seriously delicious this was, even Kevin, who typically refuses to eat zucchini noodles enjoyed the combination of the whole-wheat pasta and the zucchini. I guess that’s the trick – don’t ever try to feed a meat-lovin’, carb lovin’ man 100% vegetables and except him to swoon. Lesson learned. I was planning on having enough leftover for a lunch or two, but we ended up gobbling the entire skillet up, so just to be safe, for a family of four, I’d double the recipe. 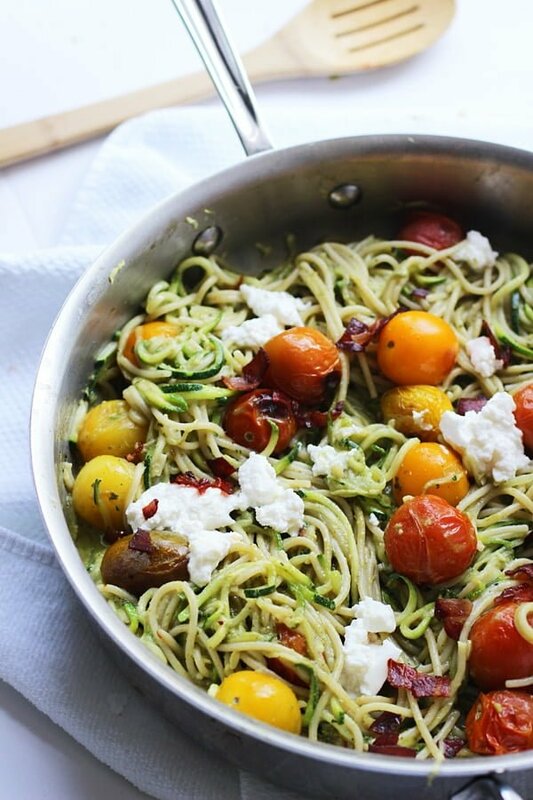 Whole-Wheat and Zucchini Noodles are tossed with a homemade basil pesto, blistered tomatoes and ricotta cheese for a healthy and seriously delcious summer dish! In a small skillet, toast almonds over a medium heat for about 30 seconds to one minute. Be careful not to burn. In a mini food processor, add basil, parsley, parmesan and toasted almonds. Pulse a few times, and then with the processor on, slowly drizzle in olive oil and water. Preheat oven to broil. 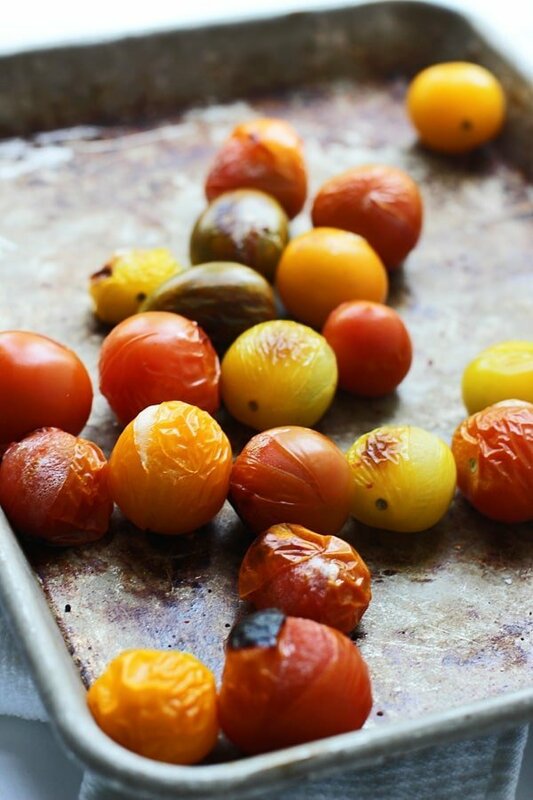 Place cherry tomatoes on baking sheet and broil until blistered and bursting about 5-7 minutes. In the same skillet you toasted the almonds in add prosciutto and 1 teaspoon olive oil. Cook prosciutto over a medium heat until crispy. Set aside. Cook spaghetti until just under aldente. Reserve cooking liquid. In a large skillet, heat 2 teaspoon of olive oil over a medium heat. Add zucchini noodles, cook until slightly softened, about 2 minutes. Add spaghetti, pesto and salt to zucchini. Cook until sauce is completely absorbed, about 2-3 minutes. 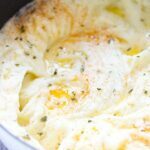 Add a ladleful of starchy cooking liquid to loosen sauce up if necessary. Add blistered tomatoes. Season with salt and pepper if necessary. Dot pasta and zucchini with ricotta and sprinkle with crispy prosciutto. 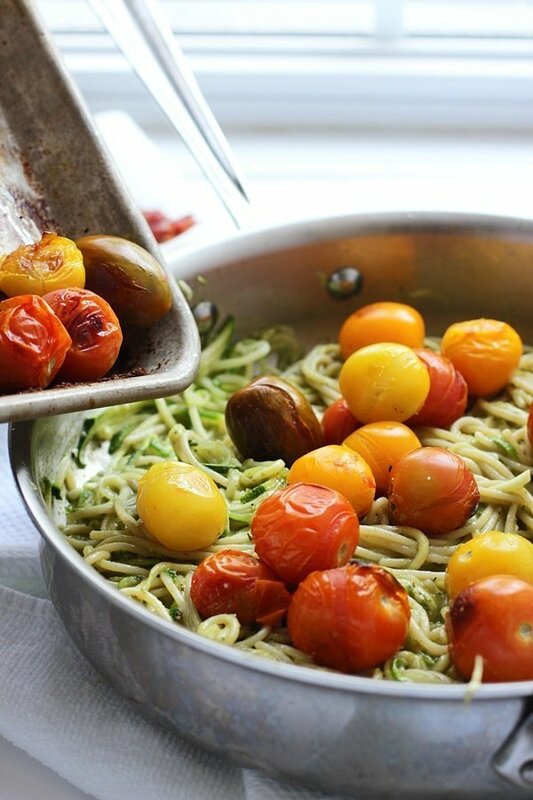 39 Responses to "Whole-Wheat and Zucchini Spaghetti with Basil Almond Pesto, Blistered Tomatoes and Ricotta"
It has become abundantly clear to me that I need to purchase a vegetable spiralizer. This looks amazing. Yes you do!! Thanks Jacki! I would have caved too! I’m always setting up hardfast rules and failing at them miserably. Oh well! This is totally my dinner. YUM! 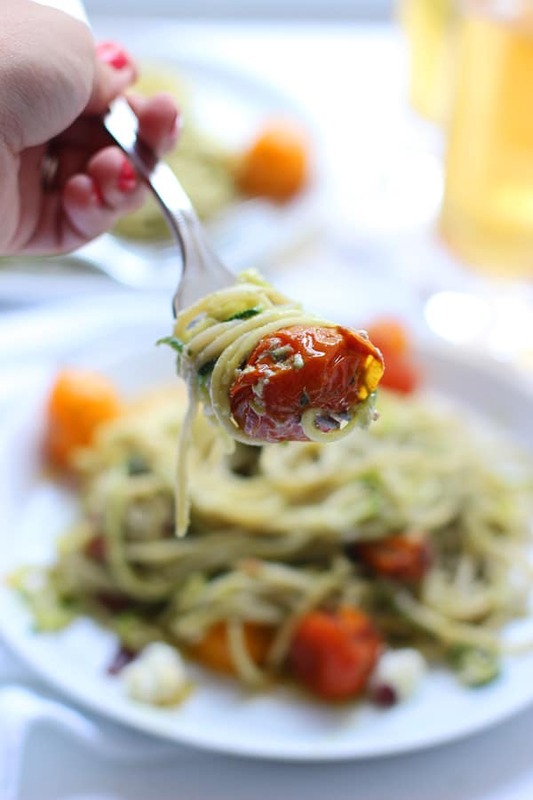 I think you compromise very well 🙂 I really like that you did part pasta part zucchini noodles – I think that’s something I could actually get the husband to not complain about! And it just looks awesome. That’s what hooked Kevin! He didn’t even realize the zucchini noodles were there until I told him — after he ate of course.. This looks like a great compromise, delicious! I think a carb-free life is impossible or if it is possible, whoever is doing it can’t be a very happy bunny! I was looking for a delicious summer pasta recipe. I’ve found it! Can’t wait to try this! This pasta is so up my alley! 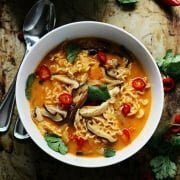 I love every single ingredient that you used! I just ate dinner and I’m so full, but I think I could manage to fit in a big bowl of this! I always try to give up dairy, but cheese just keeps calling me back! I know, how can we live without cheese?!! I’m drooling over this pasta! 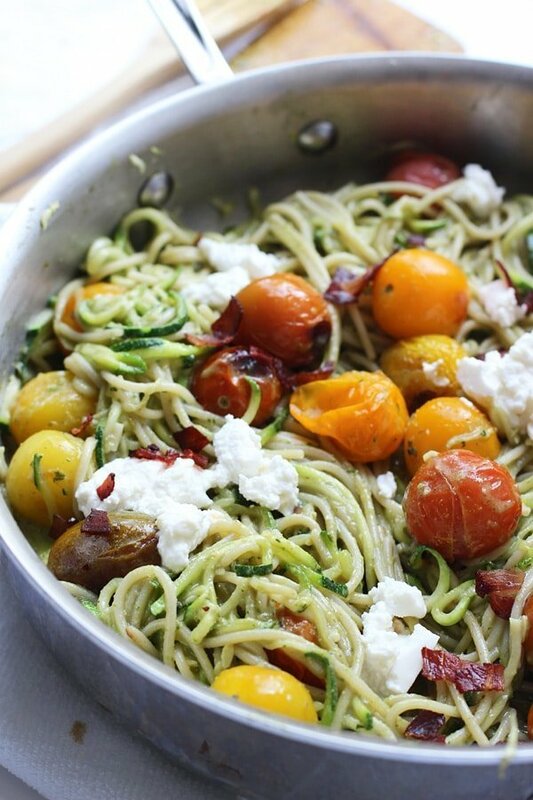 Adding zucchini noodles to whole wheat pasta is a great idea. A little carbs never hurt nobody. Aviva is a nut job but so are 99% of the other housewives. Ramona and Sonja are especially bad. But they always make me feel so much better about myself. I think that’s why I can’t stop watching. Hahaha they totally make me feel better about myself too! This looks fantastic and those blistered tomatoes are beautiful! I totally couldn’t give up carbs and dairy, I’ve given up dairy at the moment, but carbs are keeping me sane through it. This looks like a super compromise. Pinning! Thank you so much! Good for you! I always think it’s going to be no big deal to give up dairy, and then I realize I had it in so many things! 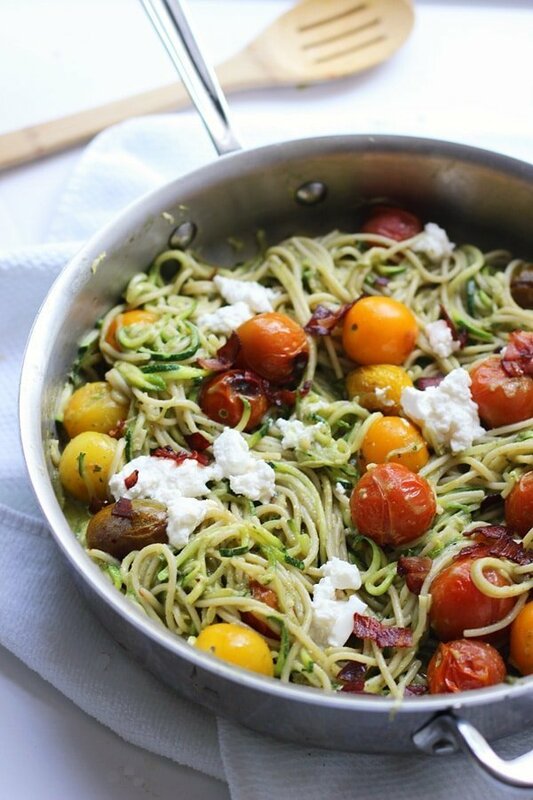 I love how you combined the spiralized zucchini with the pasta–such a great way to lighten it up (but still eat pasta, which I can’t do without!). This is so beautiful Nicole! I need to make it ASAP! This is my idea of the perfect meal. It looks wonderful! 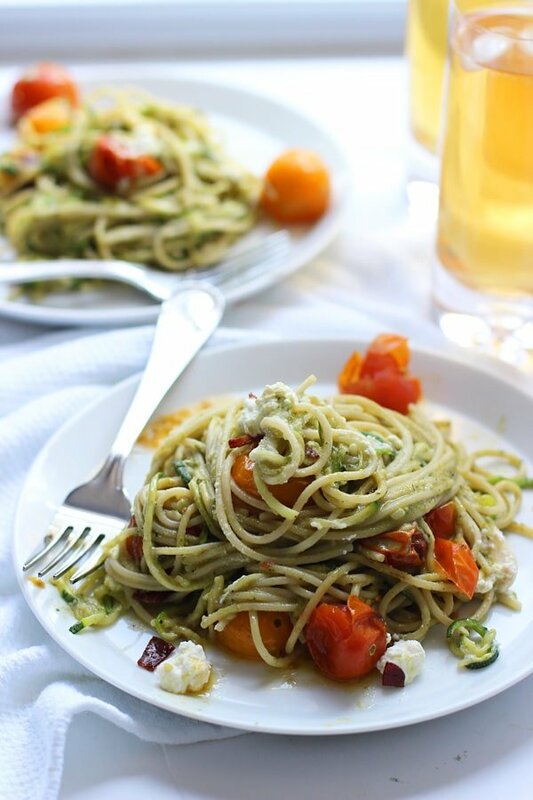 first, I love me a good blistered tomato + jazzed up pesto, so this is totally up my alley! second, if I ever tried to give up carbs and dairy I’d probably end up on the news, so there goes that. three, OMG I could not agree about Aviva more!!! chick gives me the creeps and knowing she resorted to such cheap hysterics actually makes me angry! as an amputee how could she behave so disparagingly towards her own plight? it blows my mind. that’s how you know she’s a real loon, not the fun “looney-toon” types I come to Bravo to watch lol. Totally gives me the creeps, that’s a great way to put it. She is seriously off her rocker! This dish is STUNNING and I love that last photo with the bite at the end. Girl, you nailed it! That shot of the tomatoes gets me all kinds of excited! 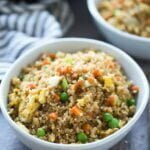 This is a great Summer time harvest dish to have on hand for quick dinner nights, I can’t wait to try this! Definitely perfect for summer Pamela! Thank you! 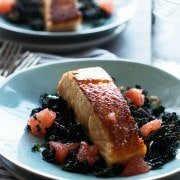 This is a must try dish! I love the flavors and beautiful colors.